There is a lifetime of experience that the 54-year old Leotildo ‘Louie” Viceral – born and raised in Taysan, Batangas – brings to his flourishing catering business. Louie and Chit Catering Service: this is the name of the food business that Louie owns and operates with his wife, the former Chita Edra of Rosario, Batangas. Louie, the holder of a Hotel and Restaurant Management certificate from the Samson Institute of Technology, worked for a year as waiter at the Banquet and Tropical Department of the Manila Garden Hotel before trying his luck overseas. In 1977, he joined the Miami-based Royal Caribbean Cruise Lines and worked with the shipping company as waiter until 1996. His wife ‘Chit,’ on the other hand, is the holder of an Accountancy degree from the Far Eastern University and is a Certified Public Accountant. Returning back to Batangas after years of working abroad, Louie broached the idea to his wife about the possibility of opening a catering business. The idea made great sense. After all, Louie had 19 years of experience waitering for one of the most prestigious cruise lines around the world. With his wealth of experience at the highest level of fine dining, Louie proceeded to recruit and train his initial staff. This included 12 waiters, 3 dishwashers and a driver. Because of her Accounting background, Chit was tasked to manage the business side of the new enterprise. For the food itself, the services of international chef Sebastian Aclo were acquired. Aclo worked from 1970-1976 at the Mandarin Hotel in Makati before likewise going overseas in 1977. Like Louie, Aclo was employed by the Royal Caribbean. He considers among his specialties Japanese, Chinese and Italian dishes. Aclo is responsible for the catering service’s very own specialties: the Hawaiian pork spare ribs, roast beef with special gravy and chicken cordon bleu. These are always the certifiable hits whenever Louie and Chit provide catering services. The first catering event for the fledgling company was for the Reña family of Rosario, whose son was to be married. Despite the expectable teething problems, the wedding reception was a success and requests for catering services from mostly friends of the family started to pour in. In time, Louie and Chit have been asked to provide catering services outside of Rosario in places like the municipalities of San Juan, Calatagan and Lobo in the Province of Batangas. Catering services have also been provided in Batangas City, Tagaytay and even as far as Antipolo City in the Province of Rizal. 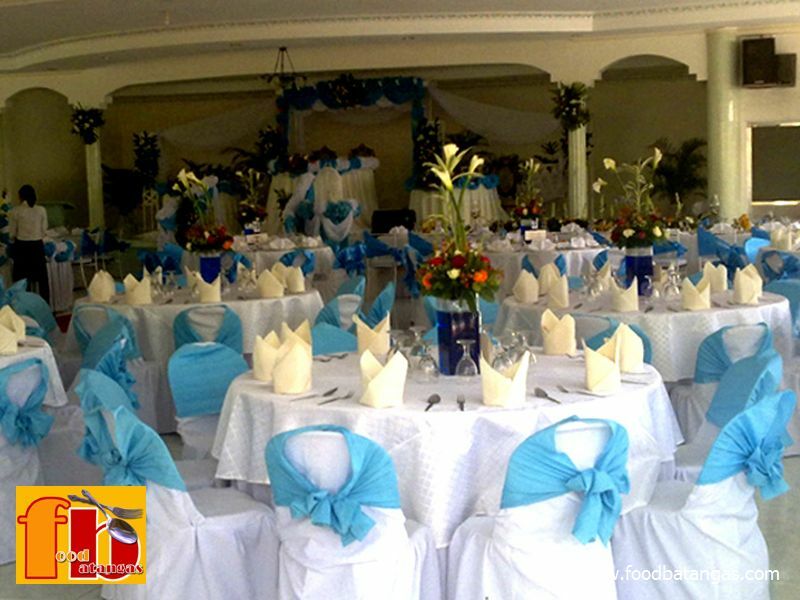 Among the events that catering services had been provided for were weddings, seminars, anniversaries, birthday celebrations, debut parties, junior-senior promenades, graduation balls and many more. Catering is accepted for as few as 50 heads to as many as 4,000. The largest even that Louie and Chit have ever catered for was the wedding of the son of a prominent political figure in the town of San Juan. A total of 4,000 guests were expected, so a crew of 35 waiters, 5 dishwashers, 3 flower arrangers and 30 assistants to the chef had to be assembled. The couple also catered for a 3-day student convention held in Calatagan during which food for 1,800 participants was required, five meals a day. They also catered for a seminar sponsored by the Batangas Province Division of the Department of education, during which a 6-way buffet was set up for the Division Superintendent, supervisors, school heads and teachers. Louie and Chit plan to build a venue for events that can hold as many as 500 guests in 2013. This, the couple says, will be the stepping stone towards the setting up of their very own restaurant in 2014. For anyone who wishes to avail of the catering services of Louie and Chit, Chit Viceral may be reached through her cellular phone number 0921-4972481 or the family’s landline at (043) 321-5538.